Certain secondary school subjects are failing to attract enough trainee teachers year-on-year, leading to huge shortfalls in the number of qualified teachers available. The latest initial teacher training (ITT) figures show that the government has failed to recruit enough secondary school teachers for the sixth year in a row. However, looking back across the last three years from 2016/17 to 2018/19 reveals the reality of the challenge faced by subjects such as maths, physics and design and technology, which consistently fail to hit their recruitment targets. Each year the Teacher Supply Model (TSM) sets targets to reflect the changing future demand for teachers in England. It is these targets that the DfE has missed now for six years in a row. The latest figures – contained within the Initial Teacher Training (ITT) Census for 2018/19, which was published last week by the Department for Education (DfE) – show that a total of 16,280 have entered postgraduate secondary teacher training for 2018/19 against a target of 19,674. This equates to 83 per cent of the target, or a shortfall of 3,394. Only four subjects have recruited enough trainee teachers this year – biology, PE, English and history. The worst hit subjects are design and technology, which recruited only 25 per cent of its target, physics, (47 per cent), and religious education (58 per cent). Mathematics, music, computing and art have also been hit hard (see table one). Last year (2017/18), the TSM estimated that England needed 18,726 post-graduates to begin secondary training, yet only 14,645 did (78 per cent). And in 2016/17, 15,460 were recruited against a target of 17,688 (87 per cent). The recruitment problems are further compounded given that the same subjects are struggling year-on-year, building up huge shortfalls in some cases. 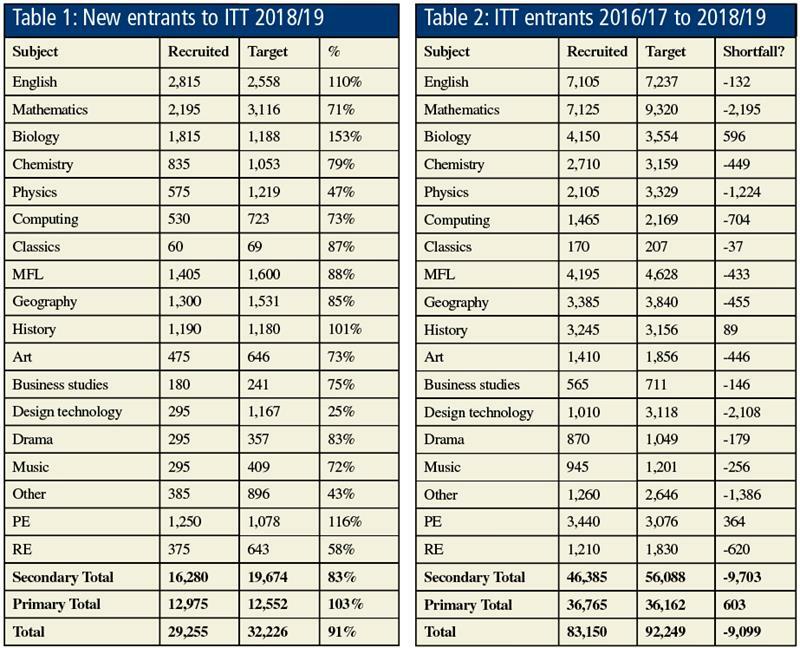 While biology, PE and history continue to recruit successfully, subjects such as design and technology, computing, physics, chemistry, maths and modern foreign languages continue to struggle (see table two). Physics has missed its recruitment targets for the last three years, meaning only 2,105 teachers have been recruited against a target of 3,329. A shortfall of 1,224. Computing has also missed its targets, meaning 1,465 teachers have been trained against a target of 2,169. A shortfall of 704. Design and technology has been hit particularly hard and has recruited just 1,010 teachers against a target of 3,118. A shortfall of 2,108. In maths, recruitment has been better but still below target. Over three years maths has recruited 7,125 teachers against a target of 9,320. A shortfall of 2,195. Elsewhere, the number of foreign teachers coming to this country to teach is down by 25 per cent, with 3,525 QTS awards being made to teachers from the European Economic Area (EEA) this year. And the number of teachers coming from further afield (outside the EEA) is also down by 14 per cent to 1,475. Commenting on the latest figures, Kevin Courtney, joint general secretary of the National Education Union, said the “crisis” in teacher recruitment remained. “The DfE will say they are training more teachers than ever but the problem is compounded year-on-year, as each year’s targets do not seek to address pre-existing shortages or previous missed targets. Mr Courtney also urged ministers to focus on teacher retention: “Recruitment to training courses is only one piece of a puzzle. Retention is also a huge problem with one third of teachers leaving within the first five years of qualifying.